FOUND! - Tribe's Greg LoPiccolo talks to Bullz-Eye! Three days after I moved to Boston in the fall of 1991, Lynne Shaughnessy, the girl that would one day become my sister-in-law, took me to Avalon, a rock club on Lansdowne Street behind Fenway Park’s Green Monster, to see a local band called Tribe. I’d never put much stock into local bands, though that had more to do with where I grew up (central Ohio) than anything else. But these guys, they were unlike any “local” band I had ever seen. A quintet with the standard Bon Jovi/Duran Duran setup of gtr/bass/keys/vox/drums, their songs were hard edged and insanely catchy, boasting lyrics that were far deeper and darker than their hook filled melodies would suggest. They weren’t flashy musicians, but they were solid, with guitarist Eric Brosius’s laid back guitar playing complementing the boisterous rhythm section of Greg LoPiccolo and drummer David Penzo perfectly. And then there was Janet. Lead singer Janet LaValley was simply mesmerizing to watch onstage. She didn’t just move around, she prowled the stage like a big cat. Dressed mainly in black, to match her jet black hair, she had a voice like Siouxsie Sioux’s but with better pitch, exotic but also extremely powerful. Perhaps the most remarkable thing about her was that she wasn’t even the prettiest girl in the band (that honor belonged to keyboardist Terri Barous). Still, just try and take your eyes off of her when she had a mic in her hands. She was a truly blessed front woman. Boston loved Abort. 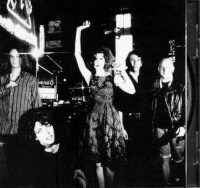 The lead single “Joyride (I Saw the Film)” finished at #4 on WFNX’s reader’s poll of the Top 100 songs of 1991, beating out songs like “Give It Away” and even Janet’s beloved Siouxsie & the Banshees’ “Kiss Them for Me.” The problem was that no one outside of Boston got the memo on how great they were. They made an appearance on Conan O’Brien, but it looked as though Tribe was going to remain a local treasure rather than a national one. That’s when the trouble started. Penzo left shortly after finishing Sleeper (he definitely played the role of a rock star in his final gigs, decked out in shades and garish outfits, and rumors swirled that his behavior irritated the other members of the band), and while his replacement, Mike Levesque, was more than capable, something was off. Sleeper had its moments, like the lip-sync mocking “Miracle of Sound,” “Red Rover,” “Romeo Poe,” and the fantastic closer “Sing to Neptune,” but the songs didn’t touch the batch they had assembled for Abort. Perhaps the most confounding aspect of Sleeper was its production; they had John Porter, the guy who produced “How Soon Is Now?” for the Smiths, one of the greatest songs of all time. But everything on Sleeper was muddled and dull, a stark contrast to the crispness of both Abort and everything else Porter has done. The band put on a brave face and toured in the fall of 1993, but called it a day in early 1994. Eric and Terri got married, and the two of them teamed up with Greg to form a company that wrote scores for video games. (One web page reported that sweet little Terri voiced one of the most evil characters in video game history.) Janet took a stab at a solo career, but like Tribe, she didn’t make it out of Boston. Both of their albums are out of print, though Abort can be had for a few bucks on Half.com, while Sleeper is selling for less than a dollar. Sigh. It’s been 10 years since I have been able to find any information on what the members of Tribe are up to. And so, I write this piece, hoping that Janet, Eric, Terri, Greg and David, or someone who knows them, will find it. And that they will contact me. Do you have info on the whereabouts of the members of Tribe? Send an email to davidm@bullz-eye.com.